The Partagas Culebras is an intriguing and powerful cigar, with its snake-like shape -39 ring gauge, 5.7” (146mm) long - comes in a box of 9 cigars. 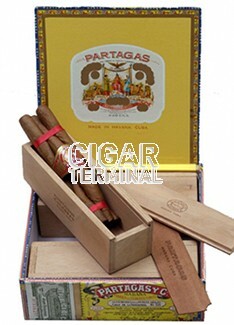 Surely the most surprising cigar from Partagas line, the Culebras is a fascinating vitola. Perhaps not the prettiest, it is named after its snake shape, culebras means snake in Spanish. Definitely the most social Partagas, share it with two other aficionados and enjoy the typical Partagas taste with a twist. The flavor is medium to strong, dominated by aromas of spices, tea, and cocoa. A cigar that every connoisseur should try. A Pre-1960 release. This stick will give you as much nicotine sting as you want in the final third. •	Rich and flavored. One of the best Partagas. •	Earthy and leathery taste, some pepper, but mild as well. These cigars age extremely well. The Culebras has a perfect construction. Its wrapper is soft and of brown Colorado color. 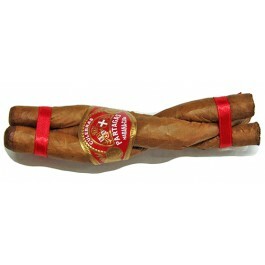 The three cigars are twisted and perfectly intertwined. Partagas hand rollers did a great job once again. In a single word: Perfect. Almost perfect cold draws. Very slight grassy and earthy tones. The cigar lights up with no efforts and very smoothly. The burn is awesome and the draw is still close to perfect. The first third is dominated by flavors of spice and smooth moist earth. During the second third, strong woody aromas of cedar are appearing alongside the barnyard, grassy taste. Spices are still there and very pleasant. In the final third, some sweeter spices and leather notes appear. The flavors become stronger, full-flavored, as you reach the nub, but never overwhelming. In summary, a relaxing kick in the head. Lots of delectable flavors. Not a serious cigar but you have to try it if you never did. But if so, don't waste your time nor your health with such "kame". This vitola is made with machines, you may try to smoke the whole culuebra in the same time - why not ! - but you won't get a better smoke. The french psychoanalyst Lacan use to smoke this cigar but he was more twisted mind than subtle ; so does a culuebra.